There is something special about the body. Without a well-defined body, it is difficult to actualize a self in humans. Even for non-human animals, we cannot help but anthropomorphize their endless forms most beautiful into arms and legs and heads – another living self. One of the most horrifying things about sea star wasting disease (SSWD) is the utter distintegration of an individual, and being able to watch another organism’s body tear itself apart. It may sound the stuff of science-fiction, but this is a stark reality for a common sea creature. Though we think pulses of SSWD have washed over sea stars throughout history, this latest outbreak trades headlines with ongoing epidemics of clade killers like white nose syndrome, colony collapse disorder, and Chytridiomycosis. Like these other plagues, SSWD infects and decimates a clade of particularly recognizable animals – one of the eponymous stars of tide pool field trips, aquariums, and snorkeling vacations worldwide. For constant beach-goers, sea stars may seem just as alien as they are ubiquitous. Surprisingly, as members of the phylum Echinodermata (sea stars, sea cucumbers, sea urchins, among others marine groups), they are our – and “our” here is in the loosest, hey-we’re-vertebrates-sense – closest invertebrate relatives, by virtue of shared developmental pathways. This may come as a shock when you realize just how different echinoderms are from our vertebrate cohort on the tree of life. Unlike us, they are not symmetrical down the center of their body, but in a radial fashion, like a sphere. Unlike us, they generally have body plans in multiples of five, and not the nice, even numbers that define so many other more recognizable animals. Unlike us, they can regenerate lost tissue with seemingly supernatural efficiency. Many echinoderms propel themselves across ocean floors with a complex system of pumps that they also use to literally disembowel themselves for disintegrating hapless prey from the outside-in. Sea stars, in particular, are ubiquitous in marine habitats around the world, are surprisingly vicious and efficient predators, and are often considered integral species in tide pools and other intertidal regions across the globe’s oceans. 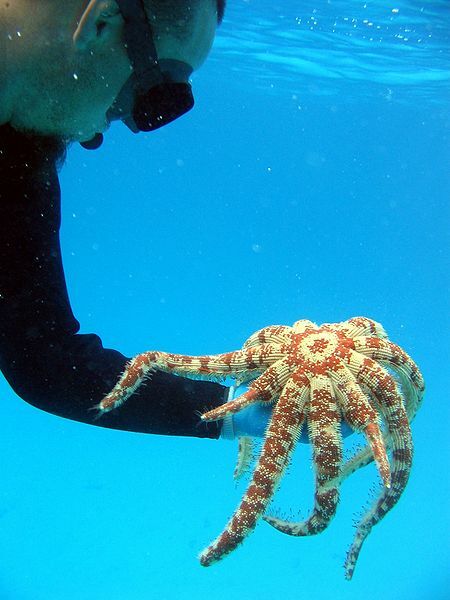 A diver with a sea star regenerating limbs. At first glance, sea stars appear to be all arms, with only a small disc for the rest of their body. It is in this anthropomorphized mindset that watching SSWD progress is particularly brutal imagery. Picture, if you will, your limbs as selves of their own, each with an inexplicable need to leave the rest of the body behind. They may be invertebrates, but it is impossible to not cringe as you watch sea literally pull apart and disintegrate, with no regeneration or recovery. 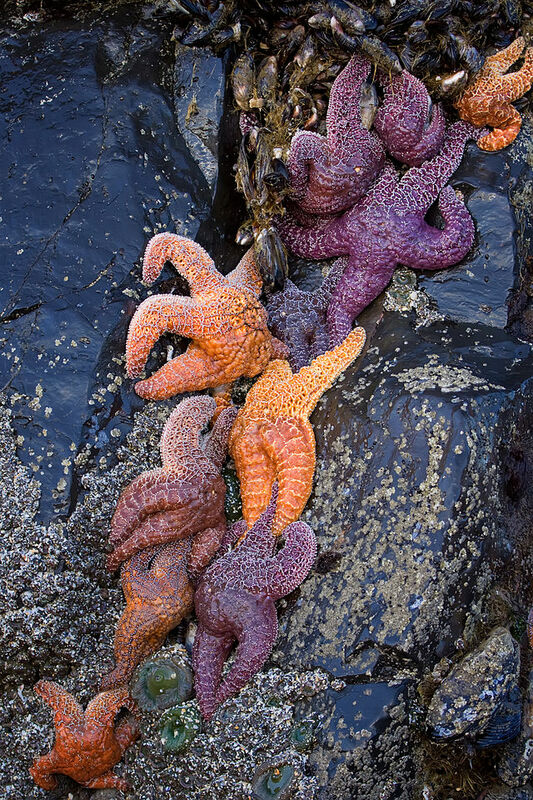 In 2013, US biologists began to notice rapid die-offs of sea stars with these symptoms, among others, along both coasts. Was it something in the water? How can a bizarre behavior like this spread so rapidly across such a wide geographic distance? How can we stop it? To make matters worse, biologists began making connections to previous die-offs of sea stars in years past. Was this the same thing, or an altogether new horror? We may not know all those answers yet, but one fact is slowly crystallizing. Our most likely culprit is a densovirus, a group of viruses known to infect many other invertebrates like insects or crustaceans. The uncreatively titled sea star-associated densovirus (SSaDV) has been linked to both mass mortalities in the field, and causes SSWD-like symptoms in the lab, according to a recently-published study by Hewson et al. SSaDV seems to indiscrimately target sea stars and even echinoderms of all different types, and may be implicated in earlier outbreaks of SSWD based on well-preserved sea stars in museums and biological collections. Yet as with many scientific discoveries with far-reaching implications, one discovery leads to more questions. How does SSaDV spread? Why is it causing mass SSWD now? How can we stop it? How did previous epidemics stop? We can only hope that, like with the other clade killers, scientists will answer these questions soon. 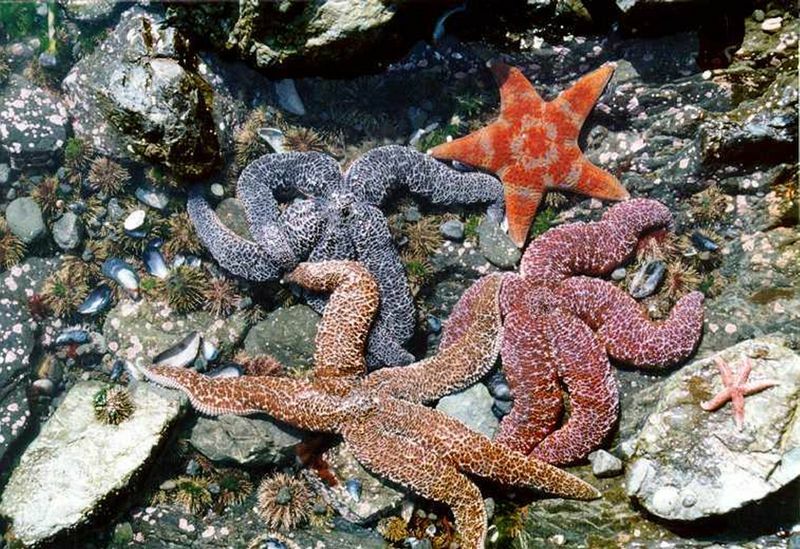 What is clear, however, are the implications of mass sea star mortality, as SSWD continues to ravage natural populations. We have long known that many sea stars are top predators and carnivores in their local communities, holding an apex position in often-delicate webs of interconnected ecological interactions. As such, they are often held up as examples of the keystone species concept, where one species – the keystone in the natural architectural marvel that is an ecological community – is disproportionately more integral to proper function than all others. Imagine post-SSWD tide pools bereft of their characteristic biodiversity, or overrun by monocultures of one or two organisms. SSWD could drastically lower marine biodiversity, considering the rich ecosystems present in intertidal regios. Even more distressing is the mounting evidence that SSaDV and its spread may be buoyed by rising oceanic temperatures. We hardly need another horror story associated with global climate change, yet SSWD may be a particularly gruesome reminder of another species that disproportionately affects ecosystems worldwide: ourselves. Only time and continued research will be able to definitely answer the many questions surrounding SSWD, and help us understand how to stop its spread from sending tidal ecosystems over the brink. Dungan, M.L., T.E. Miller, & D.A. Thomson. 1982. Catastrophic decline of a top carnivore in the Gulf of California rocky intertidal zone. Science 216(4549): 989-991. Hewson, I. et al. 2014. 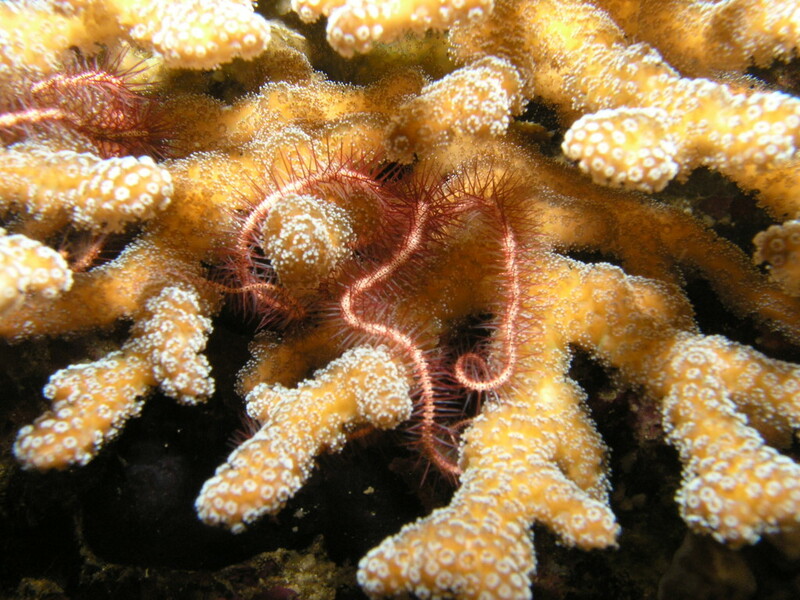 Densovirus associated with sea-star wasting disease and mass mortality. 2014. Proceedings of the National Academy of Sciences of the United States of America 111(48): 17278-17283. Maynard, J. et al. 2015. Projections of climate conditions that increase coral disease susceptibility and pathogen abundance and virulence. Nature Climate Change, in press. Paine, R.T. 1966. Food web complexity and species diversity. The American Naturalist 100(910): 65-75. Paine, R.T. 1969. A note on trophic complexity and community stability. The American Naturalist 103(929): 91-93.